Industrial Manipulators or robotics manipulators are machines which are used to manipulate or control material without making direct contact. Originally it was used to manipulate radioactive or bio-hazardous object which can be difficult for a person to handle. But now they are being used in many industries to do task like lifting heavy objects, welding continuously with good precision etc. Other than industries they are also being used in hospitals as surgical instruments. And now a day’s doctors extensively use robotics manipulators in their operations. Before telling you about different types of industrial manipulators, I would like to tell you about joints. A joint has two references. The first one is the regular reference frame that is fixed. The second reference frame is not fixed, and will move relative to the first reference frame depending on the joint position (or joint value) that defines its configuration. We will learn about two joints which are used in manufacturing different types of Industrial Manipulators. They have one degree of freedom and describe rotational movements (1 degree of freedom) between objects. Their configuration is defined by one value that represents the amount of rotation about their first reference frame's z-axis. Here we can see revolute joint between two objects. Here follower can have rotational movement around its base. Prismatic joints have one degree of freedom and are used to describe translational movements between objects. Their configuration is defined by one value that represents the amount of translation along their first reference frame's z-axis. Here you can see various prismatic joint in one system. In industries many types of industrial manipulators are used according to their requirements. Some of them are listed below. In this industrial robot, its 3 principle axis have prismatic joints or they move linear thorough each other. Cartesian robots are best suited for dispensing adhesive like in automotive industries. The primary advantage of Cartesians is that they are capable of moving in multiple linear directions. And also they are able to do straight-line insertions and are easy to program. The disadvantages of Cartesian robot are that it takes too much space as most of the space in this robot is unused. 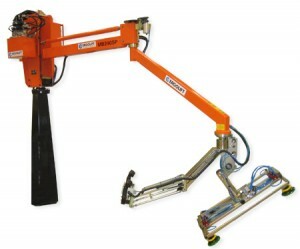 The SCARA acronym stands for Selective Compliance Assembly Robot Arm or Selective Compliance Articulated Robot Arm. SCARA robots have motions similar to that of a human arm. These machines comprise both a 'shoulder' and 'elbow' joint along with a 'wrist' axis and vertical motion. SCARA robots have 2 revolute joints and 1 prismatic joint. SCARA robots have limited movements but it is also its advantage as it can move faster than other 6 axis robots. It is also very rigid and durable. They are mostly used in purpose application which require fast, repeatable and articulate point to point movements such as palletizing, DE palletizing, machine loading/unloading and assembly. Its disadvantages are that it has limited movements and it is not very flexible. It is basically a robot arm that moves around a cylinder shaped pole. A cylindrical robotic system has three axes of motion – the circular motion axis and the two linear axes in the horizontal and vertical movement of the arm. So it has 1 revolute joint, 1 cylindrical and 1 prismatic joint. Today Cylindrical Robot are less used and are replaced by more flexible and fast robots but it has a very important place in history as it was used for grappling and holding tasks much before six axis robots were developed. Its advantage is that it can move much faster than Cartesian robot if two points have same radius. Its disadvantage is that it requires effort to transform from Cartesian coordinate system to cylindrical coordinate system. The PUMA (Programmable Universal Machine for Assembly, or Programmable Universal Manipulation Arm) is the most commonly used industrial robot in assembly, welding operations and university laboratories. It is more similar to human arm than SCARA robot. It has great flexibility more than SCARA but it also reduces its precision. So they are used in less precision work like assembling, welding and object handling. It has 3 revolute joints but not all the joints are parallel, second joint from the base is orthogonal to the other joints. This makes PUMA to compliant in all three axis X, Y and Z. Its disadvantage is its less precision so it can’t be used in critical and high precision needed applications. It is sometimes regarded as Spherical robots. These are stationary robot arms with spherical or near-spherical work envelopes that can be positioned in a polar coordinate system. They are more sophisticated than Cartesian and SCARA robots but its control solution are much less complicated. It has 2 revolute joints and 1 prismatic joint to make near spherical workspace. Its main uses are in handling operations in production line and pick and place robot. Pitch-Yaw-Roll (XYZ) like the human arm and Roll-Pitch-Roll like spherical wrist. The spherical wrist is the most popular because it is mechanically simpler to implement. It exhibits singular configurations that can be identified and consequently avoided when operating with the robot. The trade between simplicity of robust solutions and the existence of singular configurations is favorable to the spherical wrist design, and that is the reason for its success.